Now that the 2015 data has been entered, and the dust has settled, this issue will take a deeper dive into the 10 REED states - Connecticut, Delaware, the District of Columbia, Maine, Maryland, Massachusetts, New Hampshire, New York, Rhode Island, Vermont – and the results of the 2015 energy efficiency programs run by those states. With an overall six percent increase in net annual electric savings over 2014 totals, 2015 can be considered a successful year for the states reporting to REED. 2015 saw 4.7 million MWh saved whereas 2014 saw 4.4 million MWh. While every state contributed to the total energy efficiency savings, three states in particular stood out for largest increases in electric savings compared to 2014: Maine, Massachusetts, and New York. Maine increased its energy efficiency electric savings by 51,000 MW, Massachusetts by 90,000 MW, and New York by 43,000 MW. These three states increased their electric energy efficiency savings due to a combination of state-mandated targets and goals, state budgets, and depth of program offerings. For example, Massachusetts targeted more than 2.5 percent of retail sales for electricity while Maine increased its electric energy efficiency budget by $24 million dollars and ramped programs up to full activity. These policies are just some examples that allow for an increase in energy savings. 2015 was also a big year for carbon reduction. According to the EPA’s Greenhouse Gas Equivalency Calculator, the amount of carbon reduced by the REED states is akin to removing 386,000 passenger cars from the road for one year. In another nod to Maine and the strong performance by the Efficiency Maine Trust in 2015, the Pine Tree State avoided emitting 181 million pounds of CO2, a 56 million pound increase over its 2014 mark. This is the largest increase in avoided emissions of the REED states. 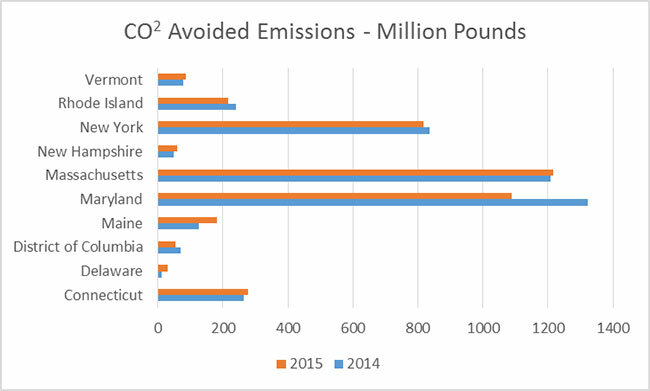 Maine’s success in 2015 is juxtaposed by multiple states that recorded decreases in avoided CO2 emissions compared to 2015. The entire year fell short of 2014’s mark of 4.2 billion pounds by 175 million pounds. One of the states that dropped off in avoided emissions was Maryland who posted 232 million pounds less of avoided CO2 emissions. Upon a closer examination of the avoided emissions data, however, that decrease can partly be attributed to a cleaner generation fleet. As a whole, Maryland and the other two PJM states in REED, the District of Columbia and Delaware, are going through a period of transition – a transition away from coal and increasingly towards natural gas and renewables – thus reducing the amount of avoided emissions due to cleaner generation. It comes as little surprise that the largest energy users account for the most energy saved. Retrofits completed on large commercial and industrial users account for more than one-third of total energy saved. With the second-most energy saved, residential lighting and appliances saved a total of 820,000 MWh, or 17 percent of total energy saved in 2015. This is noteworthy because as NEEP has pointed out, the residential lighting market is well on its way to having full efficient lighting socket saturation. 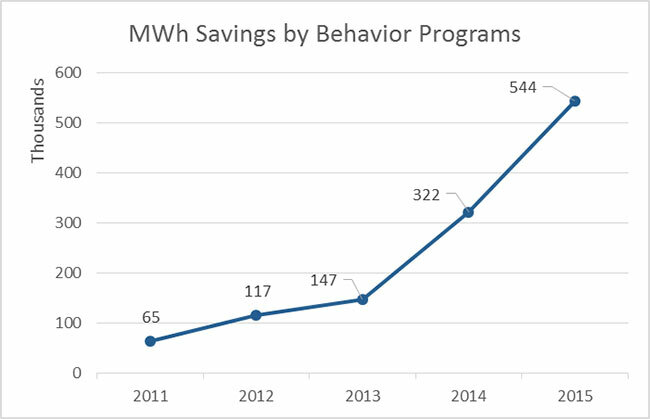 The program that is responsible for the fourth-most energy savings in 2015 is the behavior program. In 2015, six states claimed savings under this program type: Connecticut, Maryland, Massachusetts, New Hampshire, New York, and Rhode Island. While some stakeholders might question the persistence of savings related to behavioral programs, primarily administered in the form of home energy reports, together the NEEP states saved over 540,000 MWh in 2015 thanks to these programs. However, it wasn’t always this way. Behavior programs have grown tremendously in the last couple of years. The savings from behavior programs will continue as all states previously mentioned are extending their behavior programs in their filed program plans. Furthermore, it is reasonable to expect that the MWh saved will continue to increase because Connecticut, New Hampshire, and Rhode Island have only been offering behavior programs since 2014 and have not reached the same penetration and establishment as states like Massachusetts, Maryland, and New York who have been offering behavior programs for much longer. Additionally, some states in the region have not implemented behavior-based programs and don’t claim savings from such programs. Therefore, greater savings could be achieved. These are just some of the trends and results that can be drawn from the 2015 REED data. I invite you to do your own digging, comparison drawing, and benchmarking to find more tidbits.